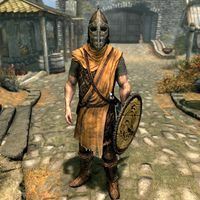 Whiterun Guards are Nord guards who act as the military and police force of Whiterun Hold. These guards serve under Jarl Balgruuf, and will defend the city during the Battle for Whiterun. Should the Stormcloak forces gain control of the city, they will be replaced by Stormcloak soldiers under the service of Jarl Vignar. Whiterun Guards, like all guards, wear a set of their city's armor, shield and helm. In addition they wear fur boots but no gauntlets. Whiterun's guards are armed with an Imperial sword, an Imperial bow, a random number from twelve to twenty steel arrows and a steel dagger. They all carry a set of common clothes. In addition they may carry two or all of the following: a torch, a beverage, and a small amount of gold. Despite being initially neutral in the Civil War, they still wield Imperial weaponry, and even after the Battle for Whiterun is completed and they formally take a side, they will still make comments indicating their neutrality. This page was last modified on 1 December 2017, at 04:42.